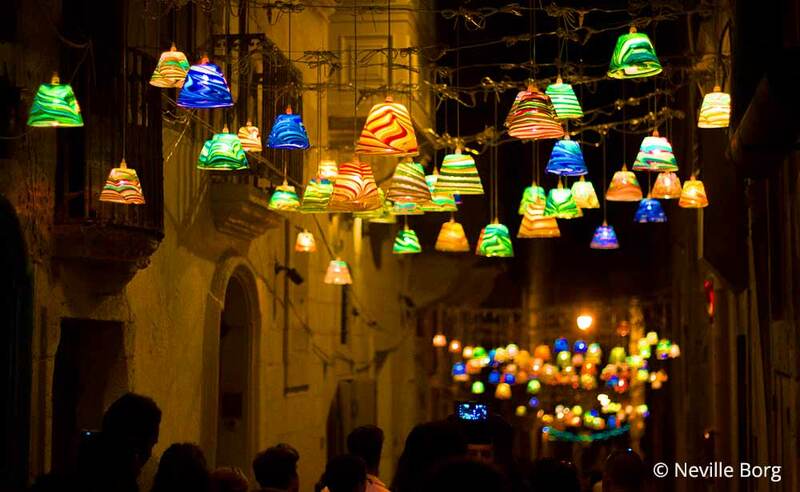 The Notte Bianca festival is a one-day event held annually every October and is one of the largest celebrations of arts and culture in Malta. It is held in the capital city of Valletta and features artists famous and new from the whole spectrum of the arts. Something Malta is particularly good at putting together. The event is free of charge to the public who flock to the event year on year. The organisers of the festival endeavour to do their best to promote local talent who have the opportunity to showcase their art professionally. If you are or ever have been a struggling artist you know how it important this is both financially and to the development of your art. The festival unfolds in Valletta. It spans from the City Gate to Fort St. Elmo. Every street, every piazza is overtaken by the event with stages and sound systems set up ready for the big name and not so big name acts to take to it. Museums and state palaces keep their doors open to the public which is a particularly nice touch. Many host exhibitions or performances to become part of the celebration. Restaurants and bars stay open catering to the crowds. Many host artists who perform their art often to an enthralled audience. This is festival Malta at its best. In 2019 the festival will be in its fourteenth edition. Due to the large crowds, special transport services are implemented and standard services extended to accommodate. In previous years, unless you are a resident, the inner Valletta roads have been closed after 5pm and visitors are asked to use the City Gate to enter the city. Shuttle busses will be in operation to take visitors from the festival and these will run into the early hours of the morning. If you are arriving from a different direction, you will be asked to approach from Lower Valletta using other entrances along the ring road. As well as the extended bus service, a special ring road shuttle service will be in operation. Ferris will operate for longer hours, running between 7pm and 2am. This will operate from Sliema to Marsamxett, Valletta, and from the Three Cities to Lascaris, Valletta and back. Taxi services will operate out of the Floriana Bus Terminal and the Gozo Channel will operate as per the summer schedule. The Park & Ride Blata l-Bajda will run through the night, and the Floriana and Valletta car parks will be open to accommodate. Finally, the Upper Barrakka lift will be in operation during the festival. You can use the lift for a small charge. The festival is one that mixes diverse and the traditional providing artists with a space to work and support, while the public is treated to view this work and have a cultural and often spiritual experience. The work is thought-provoking and often interactive. It is hard to envision similar festivals taking place anywhere in the world. Only in Malta are organisers brave enough to showcase talented artists that regularly and happily challenge the norm. Performers at the Notte Bianca are diverse. Let’s look at the kind of art and culture you can expect to see. Music at the festival is diverse and offers everything from folk to jazz to punk to metal to pop to classical performances. The festival tends to merge established stars and local talent. Last year the Notte Special stage located in George Square featured Emma Muscat and British band Top Loader. They were joined by Nosnow/Noalps, a Maltese indie rock local band. One of the great things about the festival is that different musical styles are literally a short walk away. Notte Folk brings together established stars and local talent as does Notte Metal. Not a fan of folk or metal or pop? No problem why not check out Notte Reggae or Notte Electronic. Nobody is left out at Notte Bianca, whose name broadly translates to night fair. Meanwhile, four Maltese choirs were singing their hearts out at the cathedral. While jazz musicians are performing in bars. Music is strong in Malta and the festival showcases the best the country has to offer merging it with international talent. Dance is often intriguing at the festival. Dance troupes perform burlesque shows, modern contemporary dance, and traditional dances such as tangos. Often dance is used to convey a deeper meaning. In 2018 for example, Żugraga Dance used the board game Snakes and Ladders to tell a story of love, success, sadness, and disappointment. This was followed by Rat Race, a contemporary dance that asked the question does heightened technology make us happier? Dancing to a different tune, a Tango one to be precise you could easily stumble upon George Curmi virtuoso violin featuring his four-piece band were joined by the passionate dancers of the Tango Argentine Malta Association who graced the floor. Dance often allows us to explore themes in fascinating ways that somehow draw us in with deliberate and fluid movements. With its diversity and unusualness, It is fair to say that dance is one of the strengths of the festival. Not to be outdone exhibitions are also diverse at the festival. They can take the form of contemporary and traditional. Intriguingly several government departments put on an exhibition of their services at the last festival. This was often supported by artisan stalls selling arts and crafts. Arguably the best of Mata’s government was the Malta Police Force, Armed Forces of Malta and the Civil Protection Department. They gave festival-goers a glimpse into their operations allowing them to view the interior of a CPD car. One particularly exciting exhibition was entitled IL-MOĦBA TA SITT SEKLI. Here, over 600 years of history contained in 20,000 documents were brought to life by photographer Alex Attard in one venue, while in another artists reacted to the photographer’s work. There are always plenty of comedy artists at the festival and many have audience participation at their heart. That said, stand up comedy and quite inventive and imaginative comedy is also prevalent at the festival. Like music, the organisers went to great lengths to ensure that established comedians are joined by the hottest local talent. Many of the fun aspects are aimed at families and children. Two clowns squabbling was a hit at last year’s show. The art of performing magic is alive and well and going from strength to strength and is a hit with adults and children alike. In 2018 Jean de la Voila dazzled audiences with his brand of tricks and illusions. Quite a spectacle! Theatre lovers are well served at the festival. One intriguing production was TGĦID? This explored the line that separates theatre from reality. As the production unfolded the audience could not quite tell where the acting began and ended and their views on traditional theatre were challenged. This is a good example of the imagination and creativity that goes into the artistry of the festival.